Covered California Health Insurance Exchange a.k.a Covered California will kick in from today. It is part of Affordable Care Act (a.k.a Obamacare). Covered California will implement, execute, monitor and control Affordable Care Act in California. Covered California will change the individual and group health insurance market in California. Here is a list of 9 things you need to know about this new health insurance marketplace. 1. What is Covered California? Covered California is a marketplace for individual and group health insurance. Unlike open marketplace Covered California will offer health insurance to all. You have pre existing condition and insurer will not cover you? No problem. You can now buy health insurance from the new marketplace and the insurer cannot deny coverage or charge more. Don’t have money to buy health insurance? No problem. For eligible individuals and families financial support is available. Worried about maximum out of pocket expenses in case of a medical disaster. Don’t worry. The maximum out of pocket expense is $6,350 for individuals and $12,700 for families. 2. How to Buy Insurance from Covered California? 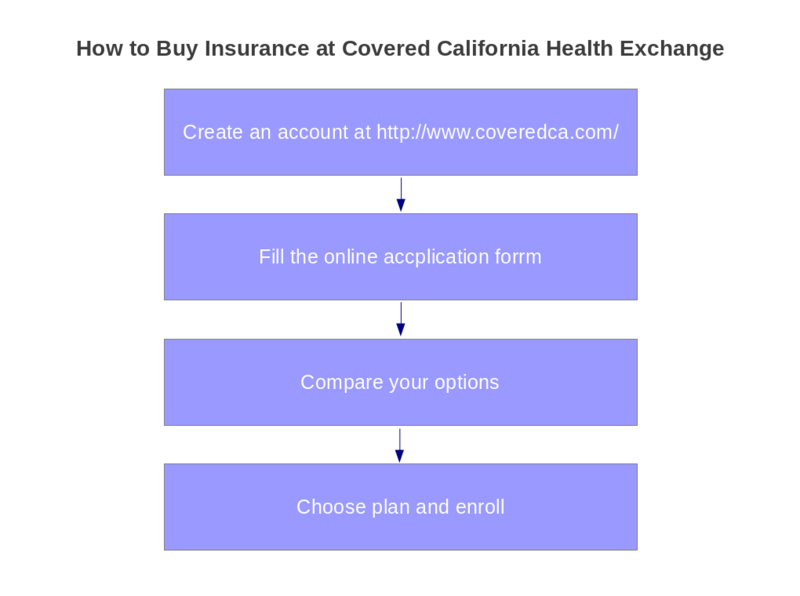 Buying policy from Covered California Health Insurance Exchange is a simple four step process. Buying Health Insurance from Covered California Health Insurance Exchange is a four step process. You can read the entire enrollment process in detail here. 3. Which carriers are selling health insurance? As of now 13 health insurance companies are selling health insurance in the marketplace. These companies are Anthem Blue Cross of California, Blue Shield of California, Health Net, Kaiser Permanente, Alameda Alliance for Health, Chinese Community Health Plan, Contra Costa Health Plan, L.A. Care Health Plan, Molina Healthcare, Sharp Health Plan, Valley Health Plan, Ventura County Health Care Plan and Western Health Advantage. For the purpose of Covered California the state has been divided into 19 regions. You should check which carriers are offering plans in your region. 4. How much will health insurance cost in the new marketplace? It depends on the type of policy. Five metal tiers have been created. These are Bronze, Silver, Gold, and Platinum. Bronze plans are cheapest but have more out of pocket expenses. Platinum plans are most expensive but will have low out of pocket expense. 5. What will be the out of pocket expense? Copay and maximum out of pocket expense varies from plan to plan as described in the table below. Assistance is available for those who cannot afford insurance. The amount of assistance depends on three factors. If someone makes less than 138% of federal poverty level he/she qualifies for free medical program in California called Medi-Cal. Financial assistance is available to those who make upto 400% of federal poverty level. The dollar amount and family size for different slabs are given in table below. The table below shows the amount the insured has to pay out of his/her pocket. 7. When will the coverage start from? The coverage will start from 1 Jan 2014. If you want insurance for the interim period you will have to buy it. 8. Is it essential to buy from the marketplace? No. Health insurance companies will continue selling insurance outside the marketplace. Buying cover from marketplace is not essential. If you feel a non-market policy suits you better you can go ahead and buy it. As per Affordable Care Act insurance companies will not be able to deny coverage for pre existing conditions etc from 1 Jan 2014. Best way is to visit the website of Covered California. You can check education and enrollment events in your county here.